Universiti Putra Malaysia campus is strategically located within the Multimedia Supercorridor (MSC) and is only a 10-minute drive from the centre of new federal territory of Putrajaya. The campus is surrounded by vibrant townships of Kajang (16 km), Seri Petaling (14 km), and the city of Kuala Lumpur (24 km). Public transport services (bus and rail commuter services) are regularly scheduled to Kuala Lumpur and nearby townships. The university operates regular shuttle-bus services between the residential colleagues and the academic complexes and between UPM campus and selected destinations off-campus such as the rail commuter stations. The UPM co-operatives store provides essential daily sundries. The small towns adjacent to the campus, Taman Seri Serdang and Seri Kembangan also offer a wide range of amenities ranging from daily sundries to academic utilities such as printing and binding of documents. The spacious, fully air-conditioned, two-block Sultan Abdul Samad Library (http://www.lib.upm.edu.my) is equipped with meeting and rooms, an auditorium that can easily accommodate more than 2,000 students at any one time. Designed to support students’ learning and research activities, the library is a variable complex of filed knowledge in both printed and electronic formats. Currently, there over 500,000 books on the shelves, and numerous bound journals, maps, audio recordings, microfilm, video tapes, and slides. Students can conveniently access the latest research materials and information; 3,000 print journals, 40 online databases containing over 36,000 full text online journals and via WiFi. The library uses the Virginia Tech Library System (VLTS) for all its operations including cataloguing, acquisition, circulation, serial control, reserve room control and online public access catalogue. Currently, the library subscribes to 2,399 current journal titles. Apart from book, journals, magazines, pamphlets, and theses, the library also provides a vast number of facilities and services including content on demand services, CDROM search facilities, interlibrary loan, photocopying and binding services. These resource materials are being extensively used to support teaching, research and extension functions of the University. Regular exhibitions are held within the library premises to promote greater use of the library materials and facilities. With each student intake, the library organises short courses to introduce new students to the facilities available in the library. The library provides information through the Reader Advisory Desk (603-86468642). 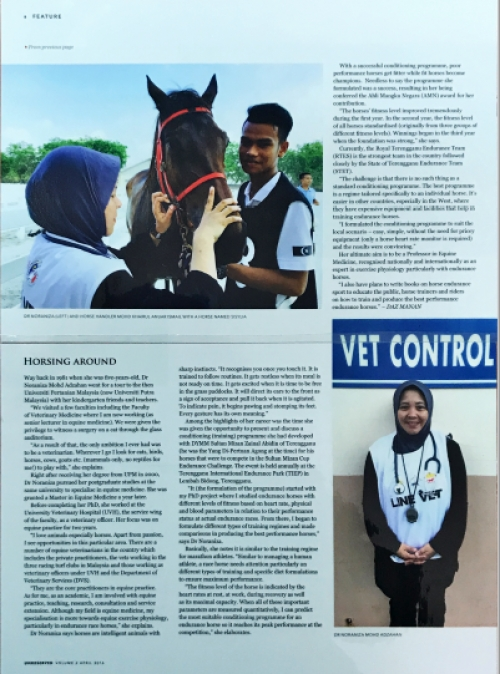 The faculty of Veterinary Medicine has its own library, a branch of the Sultan Samad Library, containing materials mostly pertinent to veterinary science and medicine. The Library, which is centrally situated in the academic building complex, has a total floor area of 650.60 m2 . The library is managed by staff of the Sultan Abdul Samad Library. Cosy and comfortable describes the on-campus residential colleges that can accommodate up to 70 % of the total student population in UPM. The university housing complex has more than 160 units of modern apartments and houses for married postgraduate students with family. Students who prefer to live outside of campus can acquire accommodation in many residential areas in the vicinity that are reasonably priced in rents, convenient, safe, and easily accessible by public transportation services. Student transportation inside and outside of campus is conveniently provided by the UPM coach services. Students can subscribe to the unlimited-ride service by paying approximately USD20 per semester. 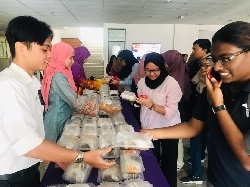 Universiti Putra Malaysia provides more than 20 university buses to cater to the needs of student academic and co-curricular activities outside the campus. Students may board the buses at designated busstops with fan-cooling facilities, lights, and notice boards to maximize students comfort. There are many cafeterias, restaurants and food stalls available within the campus and in the neighbourhood. Food can be obtained at any hour of the day, particulary at restaurants outside campus. Among well-known fast-food joints within easy reach are McDonalds, Kentucky Fried Chicken, and Texas Chicken. All students and staff have access to the outpatient services provided at the University Health Centre located within the campus. The health centre is wellequipped with the latest diagnostic and treatment equipments while providing the best drugs available in market. The health services provided are comprehensive and fast. Among the services available at the centre are general medical and dental 8 services, X-ray, physiotherapy, ambulatory, dispensary services, and laboratory tests. Universiti Putra Malaysia provides a range of facilities and services to assist students with their IT-related needs. Wireless hotspots that provide access to the Internet and other online resources including Library e-resources/e-journals and student portals are readily available throughout the campus. 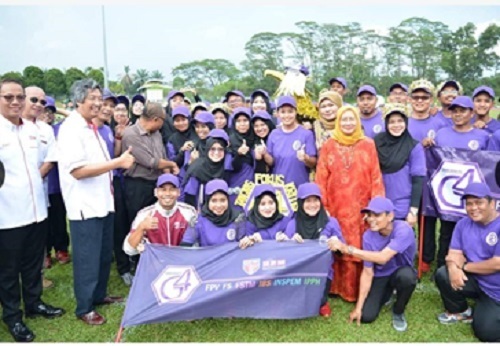 Universiti Putra Malaysia’s sports facilities are aimed at encouraging and supporting students to be healthy through sports. The Universiti is one of the few in Malaysia that offers undergraduate and postgraduate degrees in physical education. The university’s commitment to sports is evident the through of a residential block (Sixth College) exclusively for athletes. Many UPM students have represented the country in sports at the national and international levels. In fact, in the recent Rio Olympics 2016, three (3) undergraduate students won three silver medals. The campus has among others sport facilities, an olympic-size swimming pool, a sports complex with a main stadium for track and field events, a multipurpose hall for indoor games such as squash, netball, sepaktakraw, volleyball, basketball, a golf course, and an equine facility and track for recreational and competitive horseriding. The E-bika is an interactive website providing counselling service to students who do not prefer face-to-face session with a counsellor. It is similar to the concept of online communication using internet chats and real-time communications. The service has proven effective as a means for student, in private, to air their personal and academic problems and issues. 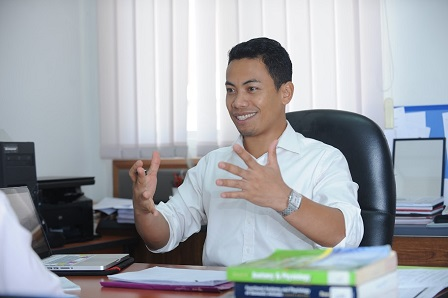 The Information Technology Department of UPM had developed the unique Putra Student Portal as the main gateway for registered students to access their personal information with ease using one login procedure. The Sultan Salahuddin Abdul Aziz Shah Cultural and Arts Centre provides a platform for students to be involved in cultural activities and performances. The Centre provides facility and time for students to showcase their talents, skills, and cultural diversity. The centre has at its disposal a huge hall that can accommodate about 2,800 people. The Experimental Theatre, an annex to the hall, can house an audience of at least 600 people at any one time. Consistent with demand of progress, UPM is now a 21st century campus with the installation of a campus-wide fiberoptic communication system and ICT infrastructure that allows for instantaneous transfer and transmission of knowledge, interactive teaching and learning, fast access to research and administrative facilities and information. All registered students and staff are provided email access with at least 20MB storage capacity for each user for their personal use. Students and staff are provided with smart cards that can be used as a matric card, library card, e-purse, and ATM access. The card also doubles as a health card containing the records or the owner. The computer laboratory in the Faculty and the Sultan Abdul Samad Library are accessible to students and staff. 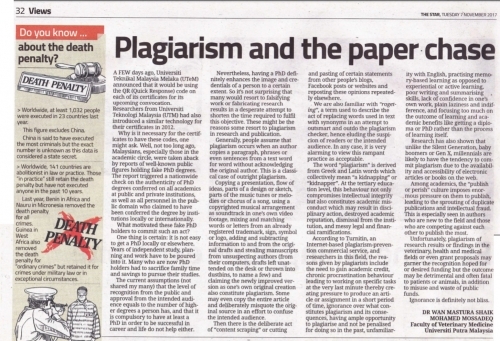 The Tribun Putra is a quarterly UPM newspaper that is available for students to keep abreast of campus happenings. The tribune features the latest on academic news, weekly activities, sports, entertainment, current affairs, and all happenings on the campus. Bulletin Uniputra is a quarterly publication featuring articles, updates, and other information relevant to students and staff. 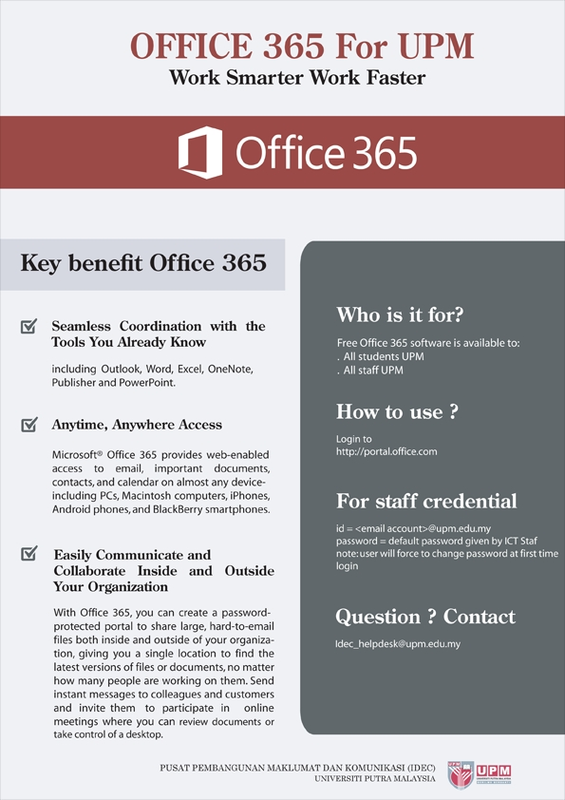 This bulletin is distributed directly through student emails. These publications not only allow students to keep tabs with what’s happening within and without the campus, but it is also a great way to stay connected with the campus community. The University Agriculture Park was established in 2001. The Park is designed to facilitate on-site teaching and learning and as a venue where research in agriculture and animal science can be conduct. The Park provides students with real-life practical assignments in a natural evironment conducive to training and learning. Basic amenities available within the campus include post office, a banks (CIMB), a book and stationery store, optical, and bicycle shops. There are currently 125 registered student associations in UPM. The associations range from student associations to various religious, sport and special interest clubs and societies. Among these associations are three that based on the origin of the members; the International Student Association, Sarawak Student Association, and Sabah Student Association. All registered students are automatic members of the Student Association of the University. This association provides the highest student governing body of the University known as Student Representative Council. All residential colleges and faculty also have their own student bodies. New students are advised to join some of these associations to enrich their University life. 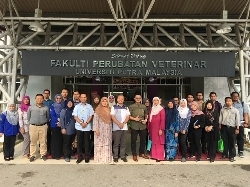 The student association of the Faculty of Veterinary Medicine, UPM is known as VETERNAK ( http://www.vet.upm.edu.my/~veternak ). The Zoologico Club (http://www.vet.upm.edu.my/~zoologic/), a special-interest society that is under the auspicies of VETERNAK focuses their activities on pets and wildlife. VETERNAK regularly organises functions and events such as Orientation Week for first-year students and exhibitions during the University convocation week. The association also organises career talk, sports, challenging extra-curricular activities such as camping, nature expeditions and even overseas trips to aid student development and in preparation for the carrier as veterinarians. VETERNAK also has close links with the International Veterinary Student Association (IVSA, http://www.ivsa.org) based in Denmark. One of the missions of the Faculty is to produce well-trained graduates to meet the manpower requirement of the veterinary industry and the Nation. Thus, veterinary training at the Faculty is optimised by the exposures of student to clinical cases and farm managements. 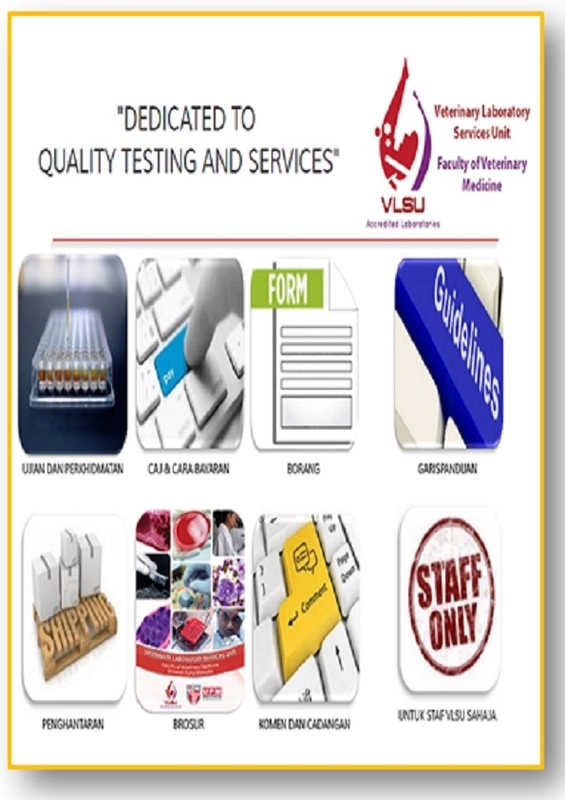 This is one of the main functions of UVH and the affiliated diagnostic laboratories of VLSU; to provide the facility and venue for students to conduct hands-on training. University Veterinary Hospital and VLSU thrive on the services and consultancy offered to the public. The cases that are referred to UVH and VLSU are the main materials used for the teaching and training of future veterinarians. 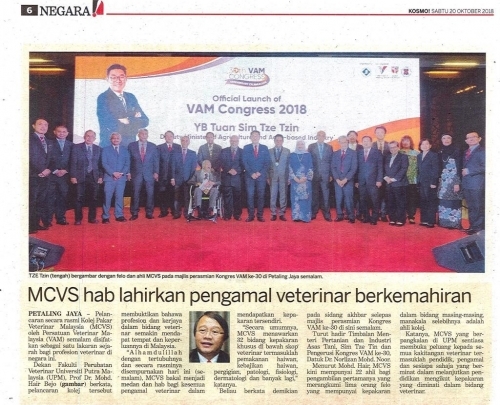 The UVH and VLSU are now fast becoming the referral center for veterinary cases throughout Malaysia. The operations of UVH is facilitated through the Small Animal Hospital, mobile Ambulatory clinics, and diagnostic services. 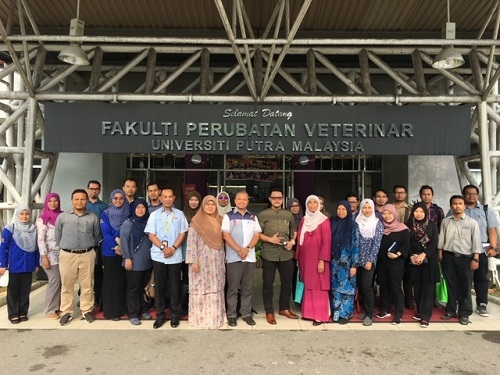 The Faculty has a small satellite veterinary clinic in Petaling Jaya, Selangor, Malaysia that is approximately 25 km from the campus. The Faculty has a special units established to provide diagnostic services and training to clients. One of the units is the Equine Unit located approximately 2.5 km from the faculty that provides stabling facilities and consultancy to the public. An Animal Resource Unit was built in the compounds of the Faculty. 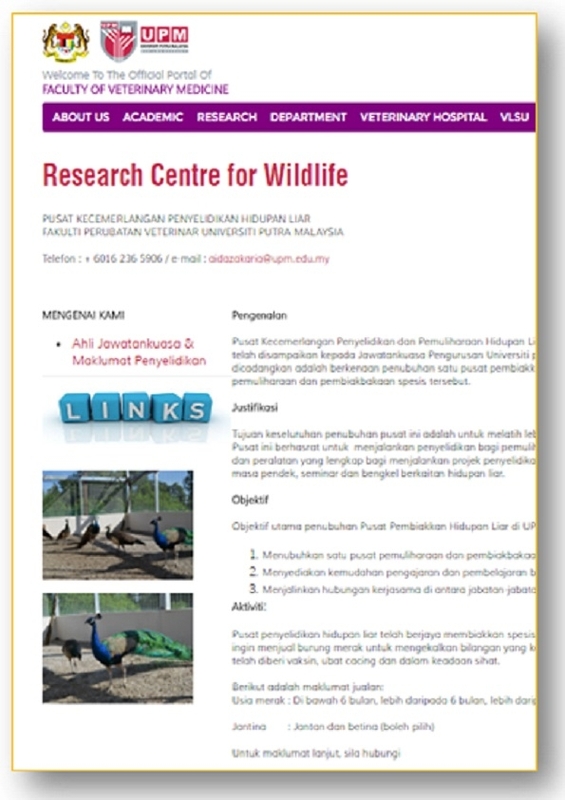 This unit provide facilities for research using laboratory animals. 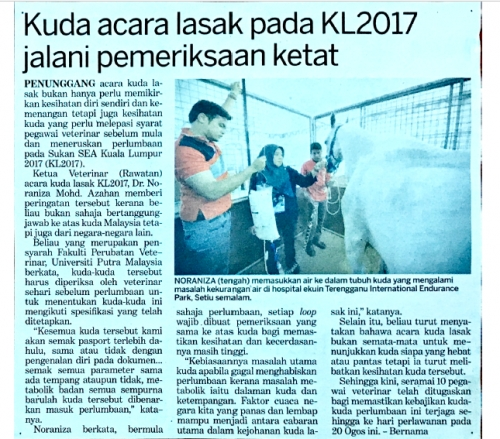 It should be noted that all research in UPM using animals are strictly and rigorously screened and monitored because the welfare of animals is one of the Faculties prime concern. The Aquatic Animal Health Unit is the one and only consultancy and research facility in Malaysia that offers specialised disease screening and verification services for shrimp and fish diseases. Universiti Putra Malaysia has vast expanse of land that is used for pasture, fruit orchards, cash crop plantations, and livestock farming. The land is managed by the University Agriculture Park. These livestock units also serve as facilities for teaching and research. 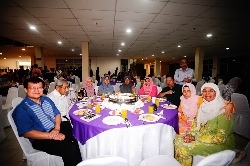 The "Universiti Putra Malaysia Veterinary Alumni (UVA)" was conceived in Links and Resources 1981 and eventually registered the Registrar of Societies in 1985 with the objective of maintaining and strengthening good relations between the Faculty of Veterinary Medicine, UPM, graduates and the community. Ordinary Membership is open to the DVM graduates of the Faculty, whilst the academic and professional staff, as well as the post-graduate alumni of the Faculty and individual interested in, or engaged in veterinary sciences are accepted as associate members. The UVA also confers honorary membership to persons who have contributed significantly and given meritorious service to veterinary science. The UVA publishes its own newsletter, the "VETLINK" while frequently organising seminars and workshops. The UVA education is well-funded and with this fund UVA supports members to attend professional conferences, seminars, and workshops. An order to bring members together UVA organises social activities such as reunion dinners, sports events, and other forms of gatherings. It is the mission of UVA to strengthen and expand the link between UPM alumni and the veterinary profession and industry. There are several methods or ways to foster understanding and friendship between all members of the academic staff, non-academic and contract / temporary. With the establishment of the Sports & Recreation activities carried out by KSRV is based on the recommendations, the requirements and demands of staff. KSRV also has organized sports and recreational activities for its members. In addition, KSRV also organizes social activities, religious and welfare both to members or to the public. 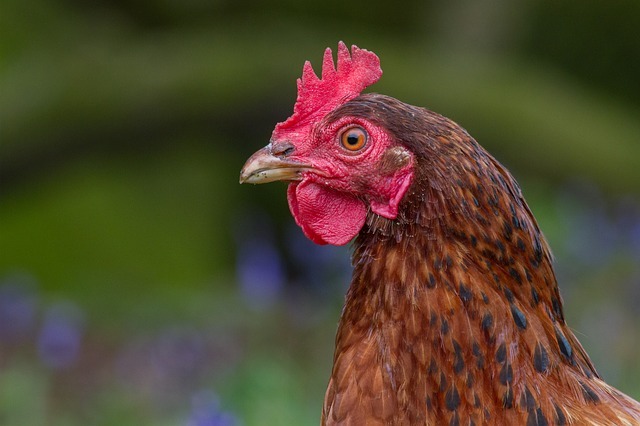 Is our strategy in controlling H5N1 in chicken effective? 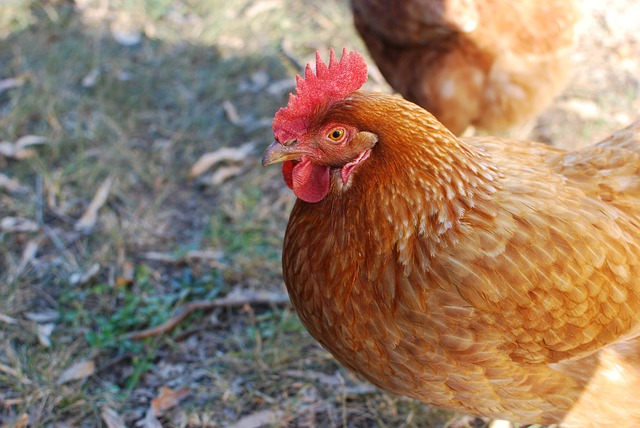 It was nearly 10 years ago Malaysia last detected the highly pathogenic avian influenza (HPAI) H5N1 in chickens. Majlis perasmian Sukan Staf UPM tahun 2019 telah disempurnakan oleh Naib Canselor UPM, YBhg. Prof. Datin Paduka Dato' Dr. Aini Ideris. Maklumat lanjut berkaitan jawatan yang dikeluarkan adalah seperti di lampiran. Mohon majukan borang dan dokumen lengkap (Kad Pengenalan, sijil kelahiran, sijil berhenti sekolah, sijil kelayakan dan sijil-sijil lain yang berkaitan) ke Pejabat Timbalan Dekan Hospital Veterinar Universiti. Hon. Prof / Dr. Prof / Dr / Mr / Mrs.
With all due respect to the above reference. 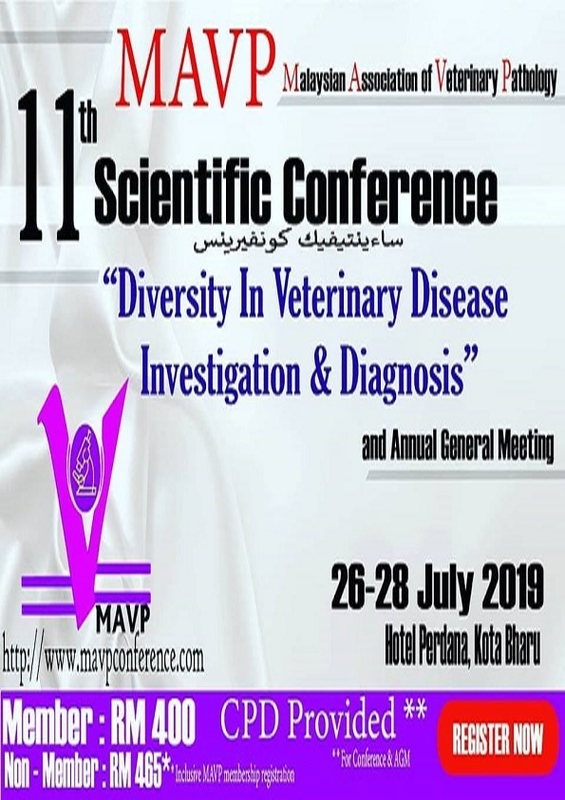 Accordingly, this e-mail announcements for informational purposes and joint action to ensure that every citizen FPV working in the area surrounding the building blocks of Academic and University Veterinary Hospital in clean, orderly and controlled so that the program of the visit goes smoothly. 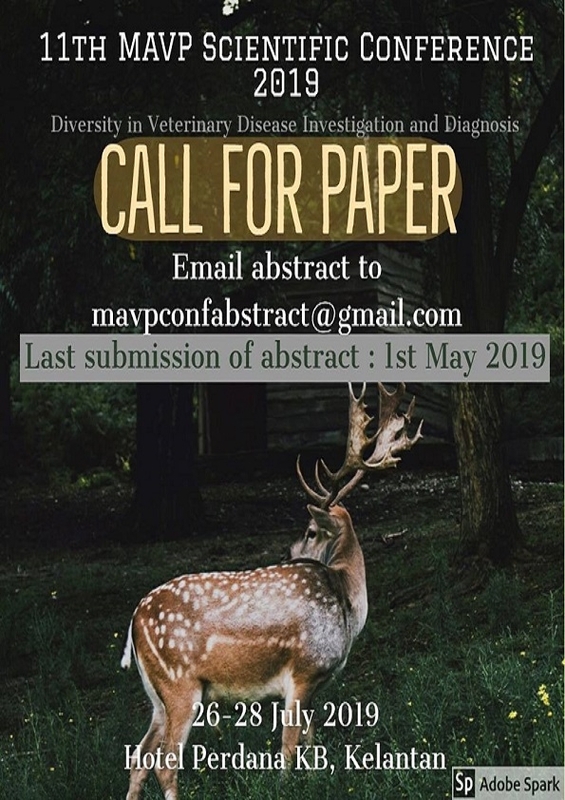 INVITATION "11th MAVP SCIENTIFIC CONFERENCE 2019"
We would appreciate if you could pass this announcement to your students and colleagues who might be interested to attend. 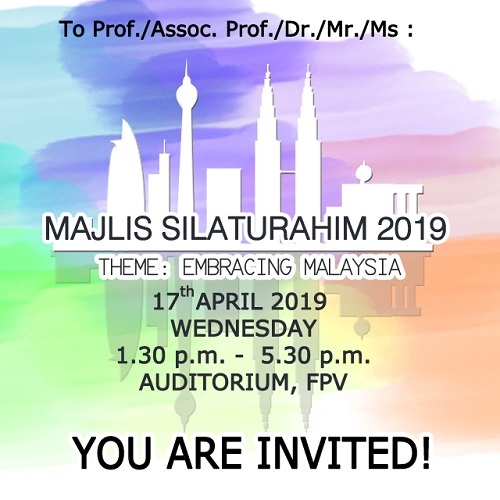 Invitation to Majlis Silaturahim 2019 - "Embracing Malaysia"
It has been a rising concern amongst many people in Malaysia in which they claimed that students in professional courses are unable to portray their talents due to their busy school schedules. 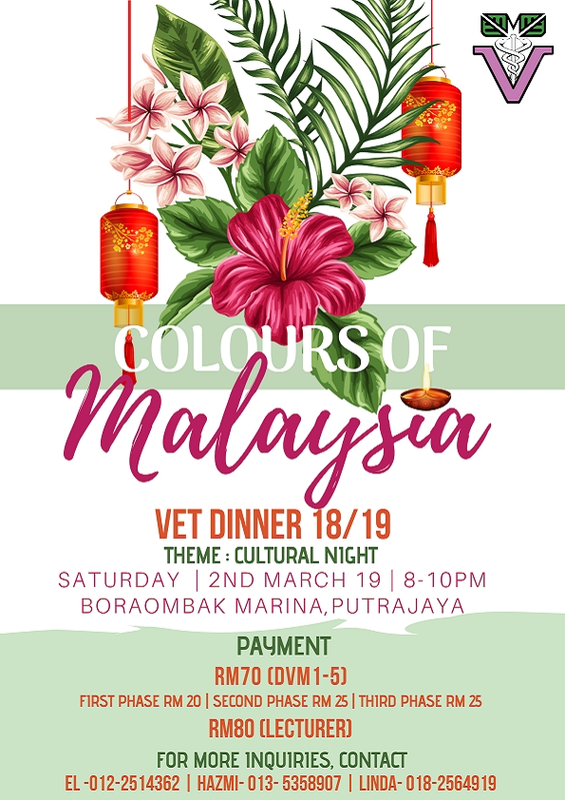 This event aims to showcase the talents of students in the Faculty of Veterinary Medicine as well as to encourage unity within the faculty. 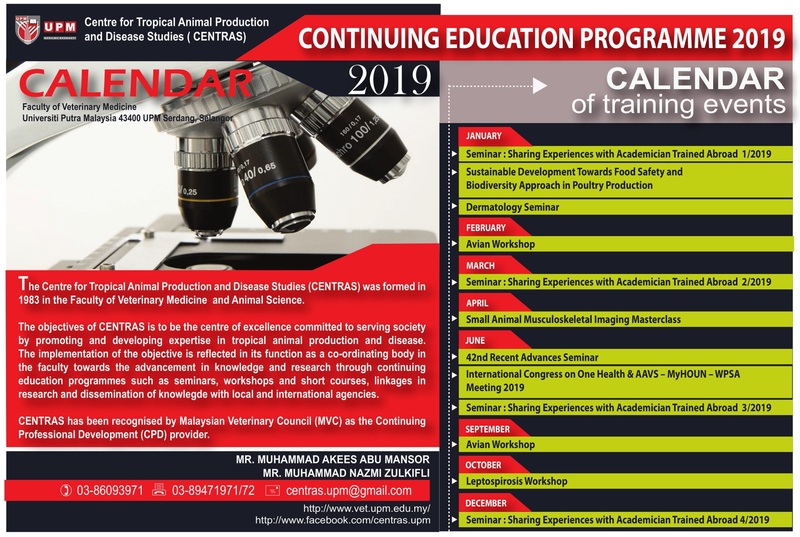 The involvement of staffs, lecturers, doctors from the Faculty of Veterinary Medicine as well as the involvement of doctors and staffs from the University Veterinary Hospital of Universiti Putra Malaysia would greatly benefit everyone and strengthen the bonds between each and every person involved. Along with this email, there is the tentative n of our programme . Therefore we hope you can attend the event to make this event merrier! Tahniah !! 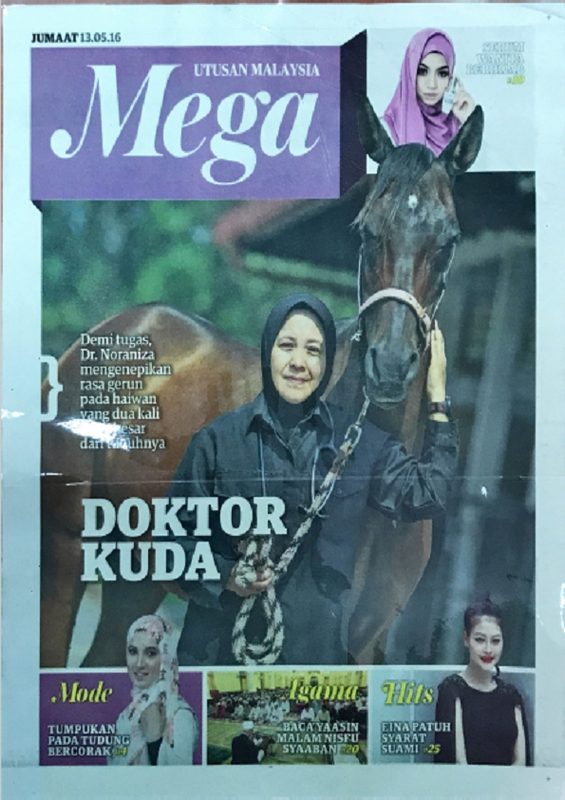 Prof. Dr Jalila Abu, Ketua Jabatan Pengajian Klinikal Veterinar telah dinaikkan pangkat dari jawatan Profesor Madya ke jawatan Profesor VK7 berkuatkuasa mulai 1 Februari 2019. 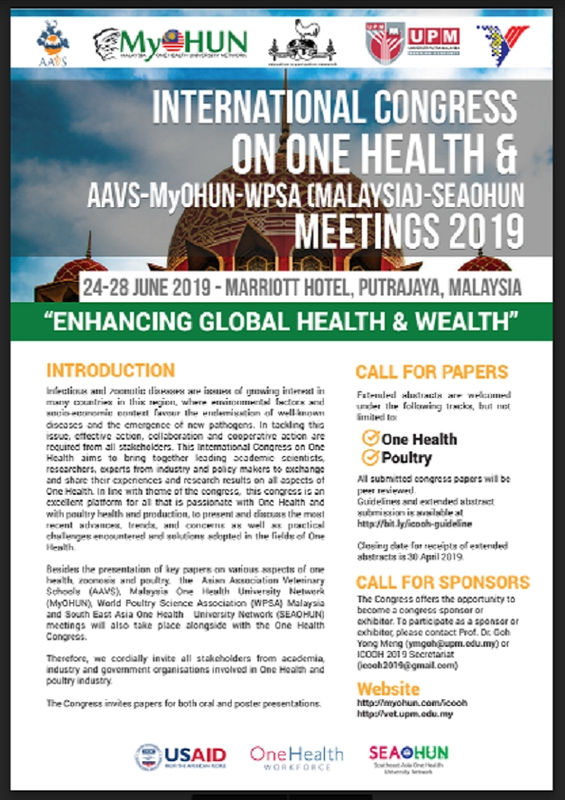 We are delighted to invite you to attend the International Congress on One Health & AAVS-MyOHUN-WPSA (Malaysia)-SEAOHUN Meetings 2019 in Marriott Putrajaya Hotel, Malaysia, from 24 - 28 June 2019. For any inquiries, please email ICOOH2019 Secretariat at icooh2019@gmail.com. Sukacita dimaklumkan bahawa Vetsport kembali lagi untuk tahun 2019. Temasya sukan ini akan bermula pada 8 Mac 2019 sehingga 21 April 2019. Pelbagai acara sukan dan permainan akan dipertandingkan pada tahun ini. Saya sebagai Penasihat Vetport 2019 ingin menjemput penyertaan daripada staf dan alumni untuk turut serta memeriahkan acara sukan tahun ini. Untuk sebarang pertanyaan dan maklumat lanjut boleh hubungi saya. "Show them age is just a number"
Majlis Silaturahim 2019 - "Embracing Malaysia"